Former president of Honduras Manuel Zelaya. When his government was overthrown in 2009, the entire content of its web presence was deleted. Detail of photo from Wikimedia Commons, by Ricardo Stuckert/PR. This article—the first of two highlighting aspects of the CRL report—examines systemic and region-specific issues arising from proliferating web content in Latin America, demonstrating challenges encountered in both real and hypothetical research examples. Worldwide City-to-City Internet Connections in 2007 and 2011. Courtesy of Chris Harrison, Carnegie Mellon University. Use of open web content, consisting of commercial, political, cultural, and scholarly websites, as well as the accessible subset of social media interchange, blogs, discussion forums, and much else, makes up a large portion of internet traffic—in Latin America perhaps even more than in North America, since, as Pamela Graham and Kent Norsworthy point out, “much digital publishing [in Latin America] is not channeled or distributed through traditional publishers but is instead only taking place on the freely accessible web.”5 To an extent even greater than in other parts of the world, the web in Latin America and the Caribbean is rapidly becoming the primary venue for information generated by the news media, governments, NGOs, and cultural organizations—in other words, the type of information that has traditionally provided the basis for the historical record. There can, therefore, be no doubt that the capture and archival preservation of web content from Latin America and the Caribbean is of great importance to students and scholars of this world region—even while harvesting and harnessing this content for scholarly use is still in its infancy, and faces particular challenges. Unfortunately, preserving web content in Latin America has been especially slow getting off the ground. Some of the reasons are inherent to the web itself, while others are specific to Latin America and its history. On the systemic side, first, there is the inherent ephemerality of the medium: new content constantly overwrites the old, leaving not a trace of what had been there before.6 Second, there is still a prejudice held by many that content on the web has no heft, that it is more akin to idle conversation than content that merits preservation. For centuries this perceived lack of archival “worthiness” has made ephemeral formats—pamphlets, posters, playbills, newspapers—a lower priority for library preservation, despite the role ephemera have played in documenting, even precipitating, momentous events of history. Third and finally, on the systemic side ethical concerns stand in the way of the preservation of much currently relevant web content, especially social media. These concerns become even more acute for web content in the human rights domain,where personal data regarding victims, informants, and perpetrators may become exposed to public view in a way paper archives cannot be. The attendant moral, legal, and political issues are aggravated by the globally perceived sense, underscored by news almost every day, that big American tech firms are predatory data gatherers, unconcerned with personal privacy and safety. Such concerns could easily scare off many smaller institutional players both here and abroad whose collective efforts to collect web-based text and data in Latin America and the Caribbean are essential, but are becoming more complicated—legally, ethically, and logistically—than ever before. Since the Internet Archive does all the crawls for Archive-It partners, among them the Library of Congress, Columbia, and the University of Texas, time skew is endemic to many web archives in the United States and Canada. This is, of course, a significant flaw in web archiving technology, at least from the perspective of researching historians.17 Perhaps this helps explain why so few researchers use archival versions of websites in published research, instead preferring to footnote a live website that may no longer exist or whose content may have changed (“drifted”) over time. Citing the original source may satisfy the scholarly requirement to document one’s sources, but in the new research environment of resources gathered on the open web, the practice often leaves the task to the reader to find—or not to find—the authentic, original content. We live in a new documentary age when it comes to studying and reporting on the societies, politics, economies, and cultures of Latin America and the Caribbean. The fixity of past research material formats is gone, superseded by electronically produced and distributed source materials that morph or even disappear entirely before or after research based on them is shared. The following article looks closely at several large-scale preservation efforts in the United States to see how these programs approach the monumental task of capturing and preserving the evanescent forms information today often takes—and to see whether scholars are using these stable and preserved resources to document their work. Jill Lepore. “The Cobweb: Can the Internet Be Archived?” New Yorker, January 26, 2015. https://www.newyorker.com/magazine/2015/01/26/cobweb. See for example Rebecca B. Galemba. Contraband Corridor: Making a Living at the Mexico-Guatemala Border. Stanford, CA: Stanford University Press, 2018. About 10% of the 102 links to open web content in this bibliography examined as part of the CRL study were no longer functioning by the time of its late 2017 release, including two to the now defunct cipamericas.org address (p. 265). According to the monitoring site Internet World Stats, of 4.2 billion internet users in the world (as of June 30, 2018, 10.4% reside in Latin America and the Caribbean, while 8.2% are in North America. Enrique de Argaez. “Internet World Stats: Usage and Population Statistics.” https://www.internetworldstats.com/stats.htm. Images by Chris Harrison of the Human-Computer Interaction Institute at Carnegie Mellon University. Chris Harrison. 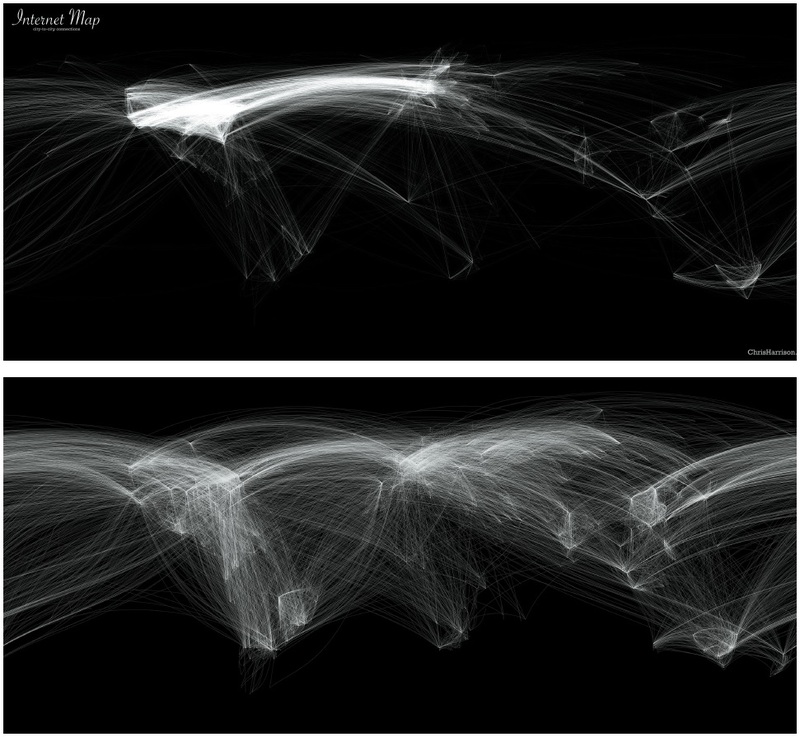 “Internet Maps.” http://www.chrisharrison.net/index.php/Visualizations/InternetMap and personal communication. Pamela M. Graham and Kent Norsworthy. “Archiving the Latin American Web: A Call to Action.” In Latin American Collection Concepts: Essays on Libraries, Collaborations and New Approaches, edited by Gayle Williams and Jana Krentz. Jefferson, 224–236. N.C.: McFarland, 2019. See http://netpreserve.org/about-us/members/ for a map showing the worldwide distribution of IIPC members. For more on politically motivated website disappearances in Latin America—including the fate of the Zelaya government pages and the Zelaya administration’s post-coup afterlife as a website—see Kent Norsworthy. “Web Archiving and Mainstreaming Special Collections: The Case of the Latin American Government Documents Archive.” In The Signal, interviewed by Trevor Owens. Washington, D.C.: Library of Congress, 2012. Graham Stinnett. “Rebel Collectors: Human Rights and Archives in Central America and the Human Rights Commission of El Salvador and the Resource Center of the Americas, 1978–2007.” Thesis, University of Manitoba/University of Winnipeg, 2010. A photo illustration from the current site of americas.org introduces this issue. Emily A. Maguire. “Islands in the Slipstream: Diasporic Allegories in Cuban Science Fiction since the Special Period.” In Latin American Science Fiction: Theory and Practice, edited by M. Elizabeth Ginway and J. Andrew Brown, 19–34. New York: Palgrave Macmillan, 2012. Also personal communication. For example, there is an archive of the Cuban SF magazine Disparo en Red at the University of South Florida, see http://digital.lib.usf.edu/disparo. Upper levels of this site have been crawled (and are preserved) by the Internet Archive, but individual issues of this magazine (active between 2004 and 2008) are not. Anat Ben-David. “What Does the Web Remember of Its Deleted Past? An Archival Reconstruction of the Former Yugoslav Top-Level Domain.” New Media & Society 18, no. 7 (2016): 1103-19. In fact, she cannot know for sure whether the document Chavez downloaded on November 16, 2014, was the same document as was on the site before the election over a month before. According to Library of Congress, LC did indeed crawl and archive the 2014 election in Brazil: as of this writing it was planned to be mounted as a collection in the near future. Gordon Mohr. “Wayback Machine & Web Archiving Open Thread, September 2010 “ In Web Archiving at archive.org, edited by Internet Archive Web Team: Internet Archive, 2010. Susanne Belovari. “Historians and Web Archives.” Archivaria: The Journal of the Association of Canadian Archivists, no. 83 (Spring 2017, 2017): 59–79.